In Colorado, it all comes down to water. All winter, snow is monitored for depth and moisture content; newspapers report running averages, percentages, and predictions. Spring rains and summer thunderstorms are greeted with smiles. You don’t see many umbrellas here – people know that rain and wind visit together, and besides, getting wet in this mountainous region is a privilege. Consider now the value of a big, blue, shimmering lake set high in western Colorado. A place where the snowmelt gathers before it is released downstream to nourish the fields of Montrose and join the rush of the Colorado River. 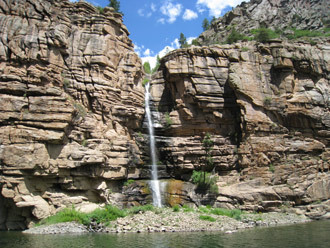 Curecanti National Recreation Area, stretching approximately 40 miles along the Gunnison River basin, contains three reservoirs, built by the Bureau of Reclamation in the 1960s for irrigation water storage and hydroelectric power. The reservoirs also provide recreational opportunities for those drawn to water in this arid, landlocked state. 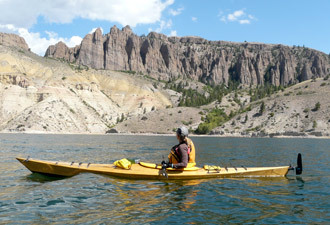 At Blue Mesa Reservoir, the largest lake in Colorado, anglers fish for Kokanee salmon, lake trout, brown trout, and rainbows. Motorboats, water skiers, and sailboats skip across the waves. Kayakers explore side canyons. People come for the fun, to this place where water is king. Beneath the waters of Blue Mesa, Morrow Point, and Crystal reservoirs lies the riverbed of the Gunnison River with its drowned towns of Iola, Cebolla, and Sapinero. In days gone by, people used the river for fishing, irrigation, and recreation. By 1882, the Denver and Rio Grande Railroad had laid tracks along the riverbanks, spurring the need for these tiny towns with their stores, fishing lodges, and restaurants. The engineers eventually gave up trying to fight rock walls of the Black Canyon and poked the tracks out through Cimarron Creek, creating a rail town at Cimarron. Today, the towns are gone, though you can find some buildings that were moved up the mesas along U.S. Highway 50. Some of the railroad tracks are visible along Morrow Point Reservoir; rangers can point them out to you from the Morrow Point Boat Tour. At Cimarron, you can see historic railcars and learn how cattle and sheep were moved to market. 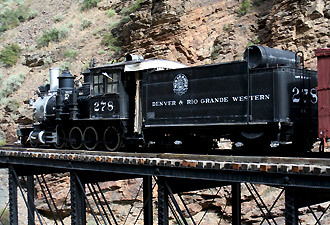 Engine 278 is temporarily away for restoration, but the trestle is visible just down the canyon from the railcar exhibit. The Gunnison River, as it flows from Crystal Reservoir, is not yet finished with its human-ordained work. At East Portal, a tunnel diverts water under a mountain and toward the Uncompagre Valley. That portion of this mighty river nourishes vineyards, orchards, and fields of hay, corn, and beans. The rest continues downstream, carving bit by bit, deeper into the Precambrian rocks that form the Black Canyon of the Gunnison. The three reservoirs of Curecanti hold reminders of the conflicts, sacrifices, and benefits associated with water use in the west and other arid climates. In Colorado, it all comes down to water.